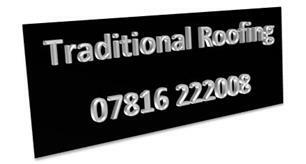 Welcome to Traditional Roofing, Established in 1985 covering the Surrey area. We have built our business Traditional Roofing through reputation and recommendations and hard work. Traditional Roofing specialises in roofing and complies with all health and safety legislations and building regulations. Traditional Roofing work on domestic roofing and take on commercial roofing, no job is too small or too big, we can commit to your needs. We have tiled the roof of (Gatwick Manor hotel) and many listed and National Heritages buildings in the Horsham area. Our flat roofs come with a 10 year guarantee, but can have up to a 15 year guarantee depending on construction of roof. We have Public liability Insurance that covers the company for the use of heat and unlimited height restrictions.